So appropriate, right? The gray, the yellow, and of course those cute long-legged birds to match the decals on the wall. Are they sandpipers? I don’t really know my birds, but that’s what I’ve been calling them. 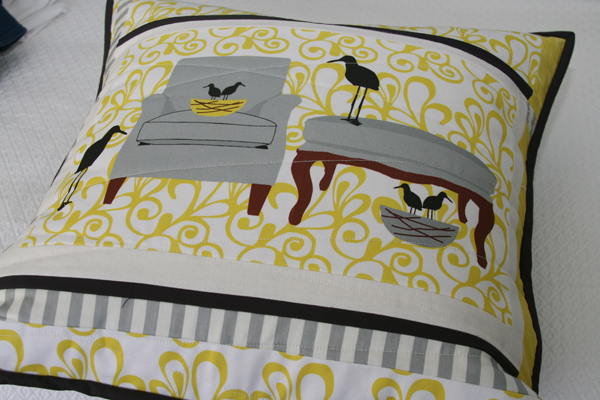 As soon as I saw Laurie’s new designs for Spoonflower, I knew they’d be perfect in this room. I was especially excited that she had designed a pillow panel to go along with the line. The panel is designed to fit a 16″ pillow, but of course the one I had on hand to cover was a 20″ pillow. I decided to cut it apart a bit to add in a few extra fabrics to increase the size. It’s very lightly quilted with some horizontal zig zag lines and I backed it in a great wide gray and white stripe, complete with a bit of yellow at the envelope closure. I love seeing it when I enter the room – it’s definitely a fun little addition to this room! This entry was posted in baby, Household Goods and tagged birds, gray and yellow, handmade, laurie wisbrun, nesting chairs, nursery, pillow. Bookmark the permalink. Oh my word, I love the sandpiper theme! What a fabulous idea for a nursery– or any room, really! too cute! laurie’s new collection is just great! 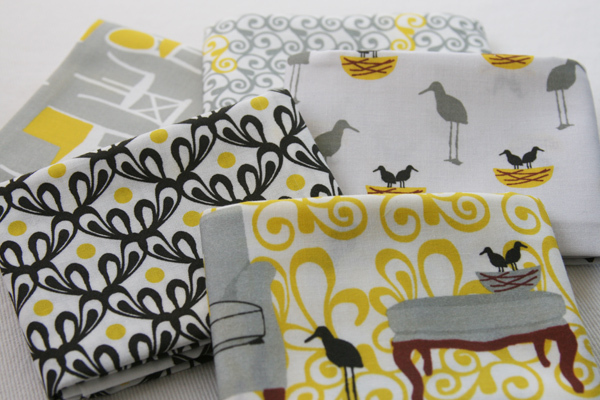 I love Laurie Wisbrun’s new fabric line!! It’s a perfect match with your room how fantastic! Your pillow cover is just beautiful Ashley and it looks beautiful on your rocker. I knew you would do something amazing with it, but as always, your creativity astounds me. Really lovely! And now I can hardly wait to see what quilt creation you come up with! Cool. I’ve been into greys and yellow (with little pops of springy green and blue) this winter, too. I love the idea of pillow panels… for a minute I was thinking you did all that as an applique! Thanks for sharing this – I’m waiting for my LW pillow panel to arrive!!! I would highly recommend a quilt to go over the back of the chair. Little babies like, no LOVE to spit up over their mamas shoulders when they are being rocked & burped. I nice sandpiper quilt will save your chair cover from many trips through the wash! I love the colour combination and the birds. Great work! 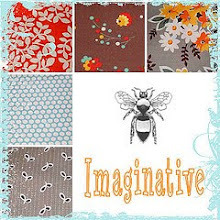 Lucky baby….sweet fabrics…whimsical… creative, pair you and Laurie! Thank you for sharing so much of this time in your life. such a gorgeous little pillow and I absolutely love the decal on the wall. This may very well be the hippest baby boy room ever! The pillow and wall decal are perfect. 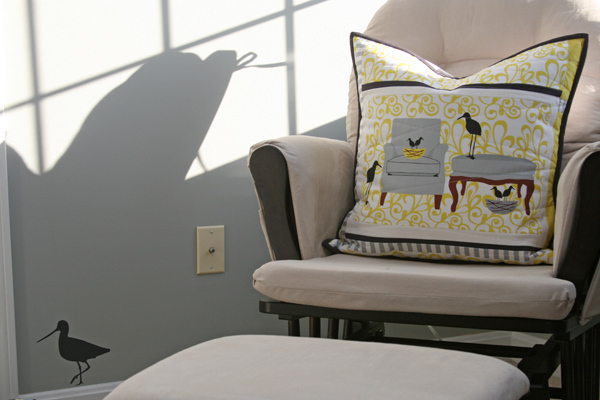 Where did you find the sandpiper wall decal that coordinates so perfectly with the pillow panel? It’s all so lovely! That’s a lovely pillow and I think the stripey back complements it beautifully. Awesome pillow! Such detail and coordination with the room! I love this pillow! It’s amazing… I’m going to have to order some of this line. 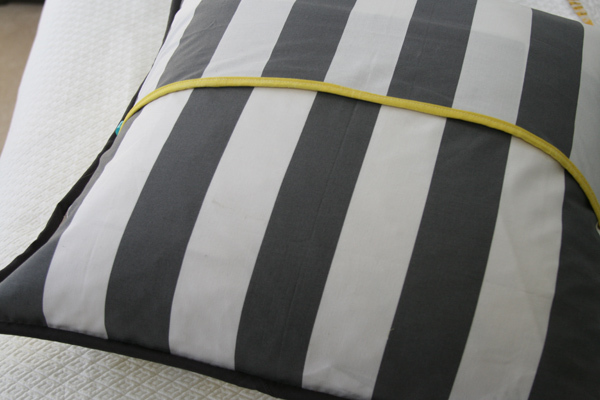 But I’m curious where I can get the grey and white big striped fabric (and the yellow) you used for the backing? I love the grey and white stripes with that little touch of yellow. Yes. Sandpipers. I grew up with then on Cape Cod, and yearn for them since living in PA. So lovely in a child’s room. They epitomize freedom and impulse and sunshine. You are brilliant! I loved those panels the minute I saw them, but I never would have thought of changing it how you did–just beautiful! waking up to your beautiful works of art is inspiring. 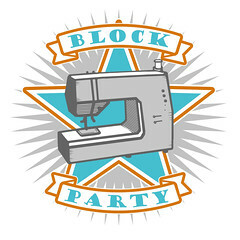 It makes me want to skip work every day and stay home to sew! Very nice! The birds look to be Ibis. I live in Florida and see them out my window every day. I love the chair you have the pillow on. I outfitted my daughter’s room with one, but she would never take to it! Love this fabric, I am getting a bundle of the coordinating prints for my birthday to make pillows for our couch and I am so excited!! Can’t wait to see the fabric in person and play with it! Your design is lovely. Love the birds, and the restful colors. Beautiful! I love the gray and yellow! It a color scheme that’s been creeping into my home over the last few years and I’m definately inspired by what you’re doing with it! Question: where did you find the wide white and gray stripe? I’ve been looking for something like that. I would appreciate you sharing your source (if you remember!) Thanks! What a match – It is a great fit! just beautiful! thanks so much for sharing.